Technically, today was like a town day. 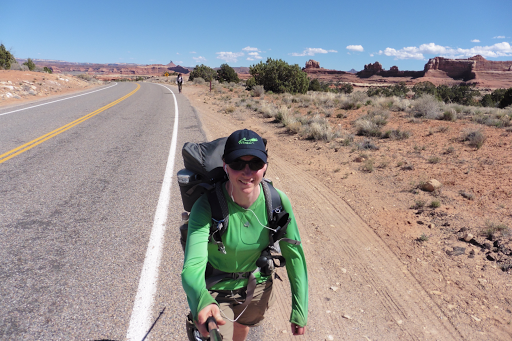 We were 15mi from Canyonlands National Park where we planned to camp at a formal campground and Katherine was headed to the Needles Outpost, to do a partial resupply. The Outpost is just 1mi off trail, but they have a terrible reputation of being unwelcoming to thru hikers. They will not hold boxes and have pricey food, but it is still six days to our next option to resupply. I chose not to give my business to them and stubbornly carried 9 days of food from Moab. Katherine carried more than she needed to so she wouldn’t have to buy a full 6 days, but still needed to go there to resupply. Another option is to cache food with a bucket through the Needles Visitor Center, but that meant driving out from Moab and planting a bucket somewhere. We realized that Katherine could avoid the extra hiking by just coming to the campground with me and then hitching to the Outpost and back while I got some much welcomed R&R. So that was the plan for today, but first we needed to get out of Rustler Canyon. 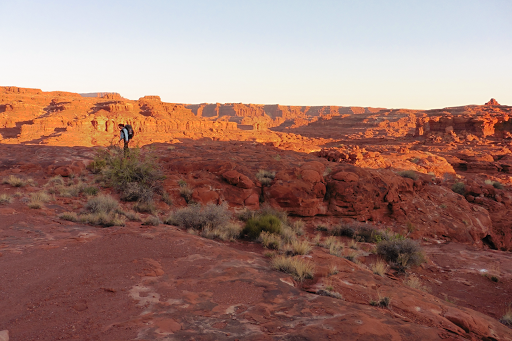 We were hiking by 6:40am and I just needed my headlamp for five minutes until it was light enough to step properly. We got to the end of the canyon and there were multiple options for climbing out. We had a good time scrambling out and were thankful to do it before the sun fully rose, but I realized that with still 7 days of food in my pack and three liters of water, it was a bit much for first thing in the morning, whew! It’s getting to be pretty fun just to climb up on things, see where we need to be in the distance and just choose out own route to get there. This time was the first time we got to the top of something and realized we went up the wrong way and might have to climb back down. How tiring! Fortunately, we realized we had just inadvertently taken one of the various alternates and were right on course. 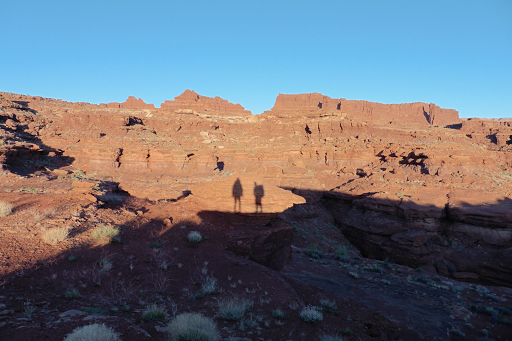 Here is the view looking down on the canyon from the top, Katherine walking on top, and our shadows just as the sun rose. We were on top for over an hour just contouring along different formations (noted as pyramids in the guidebook) until we reached the wash we needed to go down. While up there, I realized I had enough service to post the blogs, yay! I didn’t expect service for almost a week more, so future hikers know there’s plenty on the ridges after Rustler Canyon. There is one particular set of men’s footprints we’ve seen most of the way and he must be within a day or two of us. Up top, there were many footprints and it’s funny the reactions we each had. I always feel some relief to see the footprints as a sign that I’m on the right track. Katherine finds it frustrating as she came out here to NOT see footprints. I do agree that I may be forever changed though. Will I not be able to enjoy a blazed trail the way I used to now that I’ve spent so much time on no trail at all? Will it feel too artificial? I hope that doesn’t happen, but I do understand the draw to more remote places. We soon found the wash we needed to drop into. There were warnings of possible pouroffs that could be intimidating to go down. I was pretty happy to find that it wasn’t a problem at all for me to do it on my own. 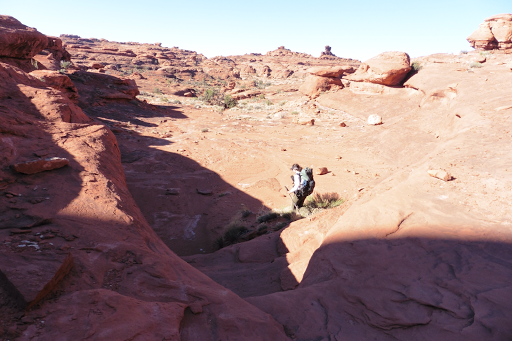 One was about 6ft high and I was able to lower my pack down and drop it a few feet and then ease myself down. I’m gettin’ the hang of this pouroff stuff and I think doing those Nic Barth alternates are what got me comfortable, so thank you Nic! Unfortunately, I didn’t get good photos of the couple higher pouroffs. 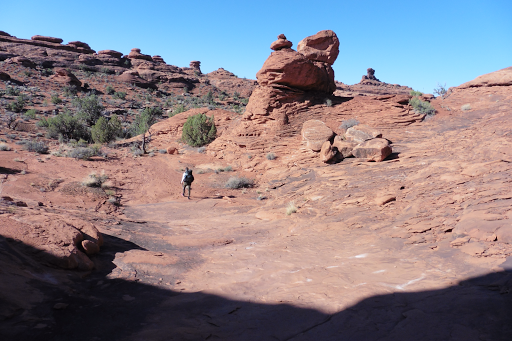 Once in the wash, the heat of the day had settled in and we hiked a couple hours in alternating deep sand and slick rock. It was nice to have the rock to break up the deep sand. The heat says upper 70s in the forecast, but where we’ve been, our thermometers are registering upper 80s to 90 at times. The locals say it’s unusually hot for this early in the spring and that does not bode well for our water sources. Good news is that in four days the temps should drop back into the 60s. I’ve been using my umbrella and I think it helps. My skin has never reacted well to the sun and I’ll probably have a week or so of heat rashes before it accepts what I’m doing. My thighs, legs, ears, and hands now have full blown heat rash. Today is the first day it itched and it actually was blistering on my hands more than usual. I decided to take action on the hands and cut a hole in my shirt to put my finger through so the shirt would cover the backs of my hands, so I hope that helps. It isn’t a sunburn (on my thighs too) and goes down at night a bit, but itches and burns if itch it. Not something new for me, but more widespread than other years and just hoping it passes like it usually does in a week or two. The great news is that (so far) the painful heat rash I always at the start of a hike on my feet has yet to blow up as that usually results in painful welts on the tops of my feet. Yes, all so fun! Here are pictures for you all to enjoy…. After we climbed out of the wash, we had a couple miles of dirt road walking and then three and a half of paved road walking. Good news is that I got to listen to more of Tracks. My feet were very unhappy the last couple hours and I’m still having that prickling feeling on my heels. Not sure what it is, but my current theory is that it’s the heat rash trying to pop up on the soles of my feet, but it can’t, so it’s stinging…I’ve had it happen on the palms of my hands like that, and it’s possible…whatever it is, I’ll be happy when this adjustment phase is over and my feet are tough again. I even got a blister under a toenail today and that was not enjoyable to pop. 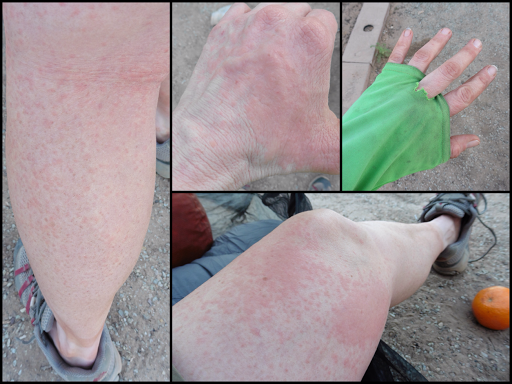 Just part of the early weeks of desert hiking. We got to the campsite and Katherine got a hitch to the Outpost immediately. I found a great couple at a campsite that had a camper and was willing to let us pitch at their tent site. Dan and Jenny were great! We actually saw Dan earlier on his mountain bike when we were hiking the dirt road. They are from Truckee which is a PCT trail town. Dan had done the Tahoe Rim Trail and will do the Lost Coast Trail in a couple weeks, both trails I’ll be doing after the Hayduke. It was fun to talk gear and chat with them. They even let me charge up all my electronics! THANK YOU Jenny and Dan! I had been at the campsite for over two hours when Katherine returned. It turned out that she could only get a partial hitch both directions, so she ended up hiking almost 5mi more…which it would’ve only been two miles if she had just done the walk directly from the trail. Not the “town day” break she needed! 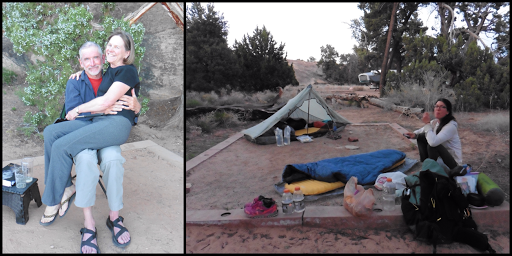 Here’s a photo of the campsite and our great hosts Jenny and Dan. 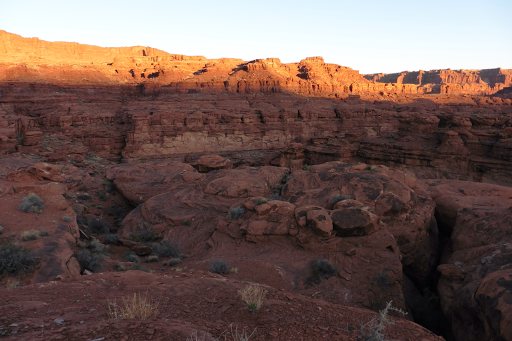 Good news is that tomorrow is a more relaxed day with a great alternate in Canyonlands on the Peekaboo Trail and then Salt Creek Canyon. We are on a permit, so we know where we’ll be camping. Six days til our next resupply point and then three more to an actual town. Man, 12 days in a desert with no shower…that’s the Hayduke! **As a bonus tonight I got to watch one of the series I have loaded on the new Sansa iXpand drive I’ve gotten for this summer. I watched the pilot episode of the acclaimed Netflix show Transparent and I think I’m really going to like it. I’m a happy camper!